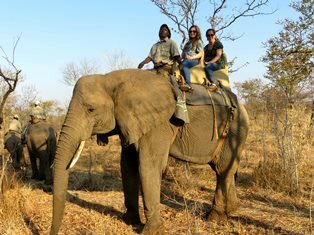 This is the first time anyone has submitted PHOWN records while elephant riding! Leah Werner is an intern at the ADU. Leah has degrees in B.S. Environmental Science and Policy and B.A. Criminology and Criminal Justice from the University of Maryland. She is in Cape Town from 7 June to 12 August to study the how many nests an individual male Cape Weaver owns in colonies of different sizes. Last week Leah had the opportunity to visit Victoria Falls for a few days with her mother. While on an elephant ride, Leah was able to take photos of several White-browed Sparrow-Weaver colonies! See Leah's PHOWN records here.